Outdoor parks are great, but they have limited usefulness when it rains, snows or in cold weather. We need indoor parks too. 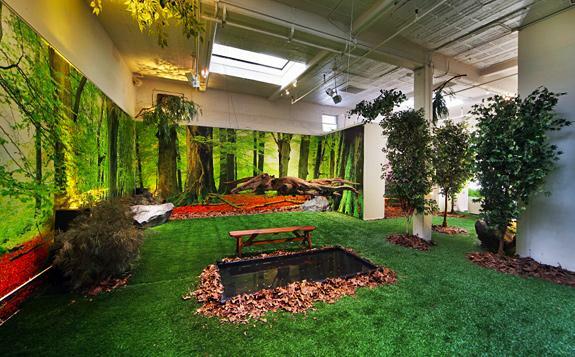 An indoor park can be any indoor public space where you can sit down and be protected from the elements. When building and or renovating public parks in Chelsea consideration should be given to add Indoor or weather sheltered outdoor spaces to them. Chelsea have 6 public outdoor playgrounds, but no public indoor playground. This means that during the winter and on rainy days there are no playgrounds for Chelsea kids except for the private (pay for) play spaces that have been set up to fill this gap. Given funding limitations one way to create indoor playgrounds is through private-public partnerships. The Privately owned public space program can be used as one form of this. Certain areas of Manhattan actually have an oversupply of outdoor POPS parks, by only allowing indoor POPS playground to be build in these areas we can get indoor playgrounds for those areas. Another way to create low cost indoor playgrounds is to create affordable housing with spaces for indoor playgrounds as part of the buildings. As is now an affordable housing project will benefit a small number of people who get the apartments. By including indoor playgrounds in these buildings the surrounding community will benefit too. You have contingency plans in place for weather like this. Usually they involve your apartment, a delivery man named Edgar and the finest reclusive sweat suits money can buy. But that was yesterday. Today, you’ll add a new amendment. One that accounts for a bright, warm, 5,000-square-foot grassy knoll of eternal spring in Nolita. Welcome to the sunny and 73-degree world of Park Here, an indoor alternative to Central Park in January, where you’ll relax on the grass during the day, and dine with a movie on the lawn during the night, open this very moment. After the Great Pyramids, the Roman Colosseum and the shark submarine, this artificial habitat might just stand as man’s greatest creation: shade trees, picnic benches, sprawling green fields and the soothing ambient sounds of Now That’s What I Call Bird Chirping #7, all moved indoors for your temperature-controlled satisfaction. It’s the kind of place you’ll retreat to for a clandestine midday nap, a gentlemen’s game of bocce (that means no biting) and a lobster roll from Luke’s Lobster, who, along with Mexicue, are there to sate your bocce hunger on the weekends. And because UrbanDaddy loves nature (defined as drinking champagne on lawns, of course), we’ll be running the park come nightfall. Expect movie/dinner nights curated by our editors, an open bar and five-course picnic baskets by the likes of Daniel Boulud, The Little Owl, The Fat Radish and Nobu. Also, fireworks. Of the figurative sense, that is. Three-year-old Wiley Koning was running and jumping on a large foam climbing structure when his mother, Angela Koning, reminded him that it was time to go. “Why are we going home?” Wiley asked, with a sad look. The plea for more play time is something Koning hears a lot. “They have a lot of fun in here,” she said. Koning is a member of the Corvallis Indoor Park, a volunteer-run nonprofit that offers a place for unstructured indoor play for infants to kindergarten-age children from October through May. She comes to the park once or twice a week. “When it’s raining outside, it’s nice to have a safe and dry place,” she said. The organization recently moved from the Boys & Girls Club of Corvallis on Northwest Circle Boulevard to the First Presbyterian Church in downtown Corvallis on Southwest Eighth Street. “It’s warm and cozy, a really positive environment,” said Lissa Bennett, who is head of the indoor park’s board of directors. The large room has plenty of space for children to bike and run, a corner for dress-up and a kitchen area for parents to bring food. But finding the space was not easy. an indoor playground need not cost millions of dollars to create.The Imagination Playground in a Box can be created in a space as little as 210 square feet for a cost of around $6,500 . Here's an idea -Swapping one 400 sq foot apartment in an affordable housing project for a indoor community playground.will help integrate the project into a part of the neighborhood. For use in indoor settings. Get a Seat near your Street!